Have you heard of Bang? You know, the miracle magic energy drink that's supposed to give you the ultimate physique and almost super-human powers during your workouts? It's the "juice" that's getting a lot of attention on social media by many fitness enthusiasts across the globe. Is Bang really all that it says it is? Recently, I've been really into fitness supplements and working out since I started training Muay Thai and boxing the beginning of 2018. With all the epic amount of training, supplements and fitness drinks are definitely in my radar. However, there have been some pretty bold claims made by the CEO of VPX Sports, Jack Owoc, that have caused the cascade of 8 active lawsuits against VPX/Bang. I believe that it is so important that brands are honest and transparent in their advertising in order to protect us, the consumers. How can we trust a drink that we put into our bodies daily if the CEO himself can't tell the truth about his own product? 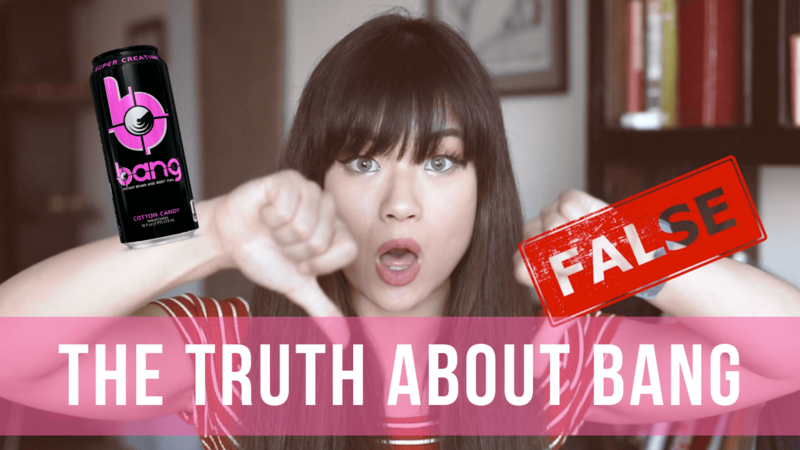 Well, I'm about to break it down for you so you can really understand the truth about bang. The CEO of Bang Energy is a former science teacher turned brand marketer who touts his "Super Creatine" product. However, testing has shown that it actually isn't even creatine at all. Also, his formulated "Super Creatine" product likely does not have the same effect as real creatine on human bodies. CLAIM 2: Bang has a valid PATENT on "Super Creatine"
There are no patents made by the United States Patent & Trademark Office for Owoc's "Super Creatine". They have all been rejected, but he still places the ribbon on his branding that the patent exists. CLAIM 3: Bang can "Reverse Mental Retardation"
This is just rude and wrong. There are no studies shown that proves this drink can reverse ANY mental disabilities. As someone who used to work in the stroke, Alzheimer's, and demential clinic at UCLA Medical Center, i can attest that these claims are wrong. There are ZERO studies released that bang can help cure these degenerative diseases. Period. It's interesting Owoc claims that the amount is meaningful when the test released information otherwise. These confirm that the contents are 0.15 BCAA grams per can, which is 100 times lower than the amount tested in research cited by VPX. Ultimately, I am a firm advocate that brands and businesses hold a responsibility to properly represent their products with the utmost truth and honesty. As someone who works in brand development and marketing, this is absolutely vital for the success of a company. Clearly, this is something I WOULD NOT put in my body, and I HIGHLY recommend checking out https://www.thetruthaboutbang.com/ for more information.